The Virtual Fourth Season is here! Gargoyles is without doubt one of the best shows on television (animated and non-animated) and it is with great pride that I call myself a fan. Like any good fan, I write fan-fiction, located in the Library. Apologies for the long wait for this latest update: I went from having no job to working two of them, which has left me very little time for working on the computer. "Madam, they burned witches like you in the Middle Ages!" "Mister, you are living in a fantasy world!" --Macbeth and Margot, "The Journey"
"Devoted wife, mother, and one-woman vigilante squad." (Hanging up phone) "What a woman." 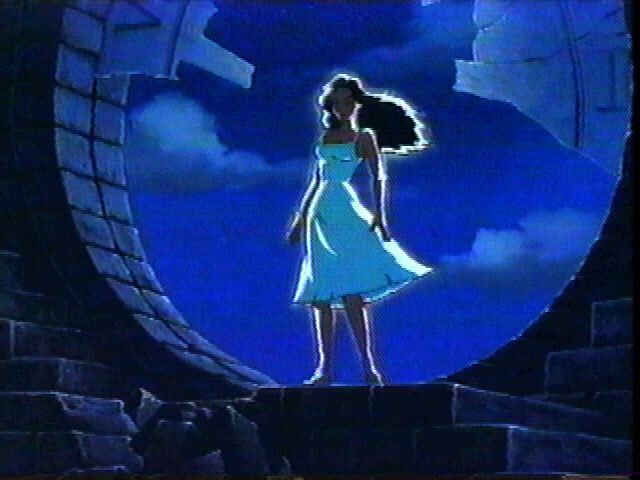 --Xanatos, "Broadway Goes Hollywood"
"If I'm to leave this world tonight, I'll be wanting company." --Hudson, "Dying of the Light"
"What do you know? We got a fan club!" --Broadway, "Dying of the Light"
Finally an answer to that long-pondered question: What does a gargoyle smell like? "It wasn't hard to figure out, Hudson--late night visits only, your accent, that smell." "Well, you tell me. Sort of like old leather and concrete, uh, but in a good way." --Robbins and Hudson, "Dying of the Light"
The kiss from TGC. Elisa and Goliath, "For It May Come True"
And where else did we finally get those three little words? --Elisa and Goliath, "For It May Come True"
"Unless you two want to stay like that for the next twelve hours, we'd better go." --Hudson, "Seeing Isn't Believing"
"Well done, Maxwell. At the next rally you must remind me to award you a silver hammer." --Castaway, "Angels in the Night"
We lived in a world that understood our purpose. Ten centuries later, we awoke to a world bent on our destruction. Somehow, we never lost hope. And today we come full circle. Station 8's Audio Archive In the process of rebuilding the sound archive from the FTP site, but also containing other goodies such as the theme to the show--in several languages. Raptor Woman's Home Page Offering sound files as well as pictures from one of the best fan artists on the 'net. The Gargoyles Fan Website--The one that got me hooked on the show. In the process of moving. If, (like me) you regularly view the web from an old browser, and the above link doesn't work, try here. The Station 8 Gargoyles Page--With chat rooms, info on IRC, "Ask Greg", and tons of other stuff. The New Gargoyles File Archive. Avalon--another Gargoyles' lover's paradise with some great graphics. Click here for Avalon Now! If you have trouble downloading any of the above files, or any comments or suggestions for future themes, feel free to email me, Anne Jensen. 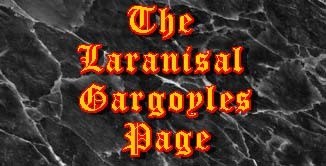 Return to the entrance to Laranisal..
Disclaimer: "Gargoyles", "The Goliath Chronicles", and all characters etc. are owned by Disney and Buena Vista (ie, not me). This page is in no way associated with either of these companies. It is simply one fan's tribute to the genius of the show and is not done for profit. Use of any copywritten material is done without permission.